The hatchback scene has really started to heat up over the past few years, and there are plenty of solid options out there for anyone looking to join the legion of hatchback lovers. If this applies to you, but you aren’t quite sure where to start, come pay us a visit at Westbury Toyota. We might just have the perfect car for you: The 2019 Toyota Corolla hatchback. It’s got a stylish exterior to rival that of all others in its class, a surprising amount of performance potential, and all the interior bells and whistles you could ever hope for. But don’t just take us at our word – below we’ve written up all the stats, specs, and features you’ll be able to find in the newest Corolla hatchback. Take a look for yourself! 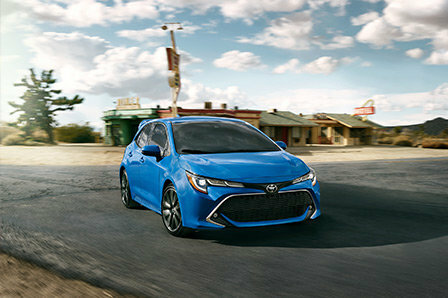 The 2019 Corolla hatchback boasts a shiny new suspension, designed to give you a more exciting driving experience. The center of gravity is low to the ground, which increases overall stability and boosts responsiveness when turning. The new suspension also keeps the car solid when navigating twisting or bumpy roads. Also new for the latest version of this hatchback is the engine. The Corolla hatchback offers up a 2.0 liter (L) Dynamic Force 4-cylinder DOHC 16-valve D-4S Dual Injection VVT-i that’s capable of putting out a pretty impressive 168 horsepower (hp) and 155 pound-feet (lb-ft) of torque. Depending on the trim level, the engine is either paired with a six-speed manual transmission or an automatic continuously variable transmission (CVT). Both transmissions have their perks, which Mark Richardson of The Globe and Mail describes in detail: Models equipped with the CVT have lower fuel consumption levels and the manual transmission has an “Intelligent Manual” button, which automatically equates engine speed with downshifting. The benefits of the Intelligent Manual feature? It eliminates the jerking you often experience while downshifting, allowing for an impressively seamless ride. The Corolla hatchback has a distinctive standout silhouette that you’re not going to see on any other hatchback. It’s got a large, attention-grabbing grille that really defines the front end. The rear end has all the right curves in all the right places with the liftgate nicely emphasized by LED taillights. The XSE trim level adds a little something extra to the exterior with integrated fog lights, a chrome front grille, and 18-inch machine alloy wheels with P225/40R18 tires. In addition, a chrome rear diffuser is standard across all three trim levels. The Entune 3.0 Audio System which allows you to navigate the infotainment system with a simple finger swipe and includes a fully configurable homepage to suit your preferences. In short, drivers and passengers riding in the newest Corolla hatchback won’t want for much! The 2019 Toyota Corolla hatchback is one of the leaders in its class, and for good reason. It offers up everything drivers need, integrated with all the important features that drivers want. If you find your interest piqued after reading through our little overview, please don’t hesitate to pay us a visit here at Westbury Toyota. We’d love to talk more with you about the Corolla hatchback and how it just might be what you’re looking for in your next automotive purchase!